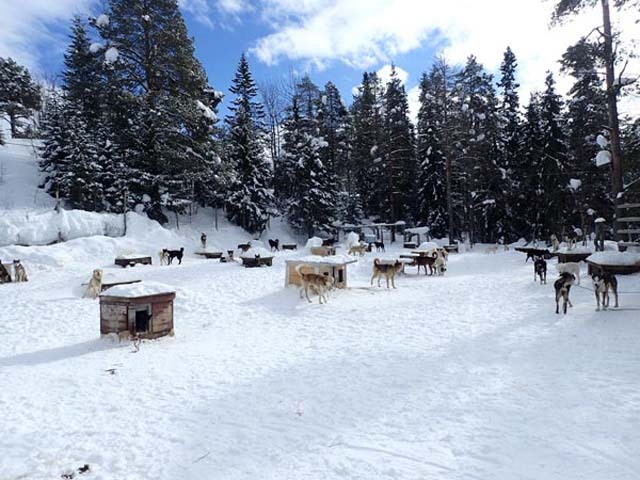 Bob from the Nature Travels team visited the kennels for a short sled adventure in the Jotunheimen mountain region in March 2018. The Nordic countries in general have been blessed with a spectacular winter season this year – and nowhere was this more in evidence so than on my recent trip to the Jotunheimen area in central Norway, where in combination with researching new activity possibilities in the area, I was visiting the kennels which are the home of our Husky Sledding at the Foot of the Jotunheimen tours. 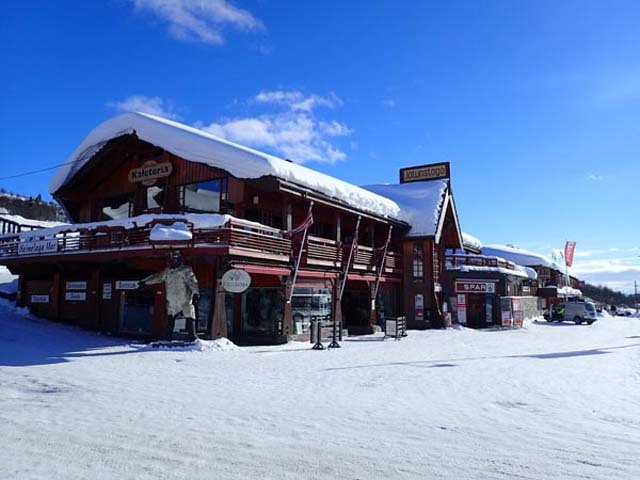 Having flown out from the UK in the morning and taken the bus from Oslo airport, I found myself standing in the attractive winter resort of Beitostølen blinking in the bright afternoon sunlight, surrounded by a glorious vista of snow-covered mountains. It was a rare pleasure to arrive in mushing country with such straightforward (and very affordable) travel connections – a direct flight London-Oslo followed by a bus from Oslo airport into the centre of town and a direct onward bus to Beitostølen (both bus journeys can be purchased as a through ticket). And what country it was! Norway is ridiculously scenic almost everywhere you go – as a French colleague remarked later in the week, the hard part is not choosing whether or not you want to go to Norway, it’s deciding which of the multitude of stunning areas you want to visit next. Bygdin, just outside Beitostolen. Photo: Nature Travels. After a cosy evening and recuperative sleep at a charming traditional mountain hotel a few km outside the village, the next morning I was definitely ready for some dog sledding! 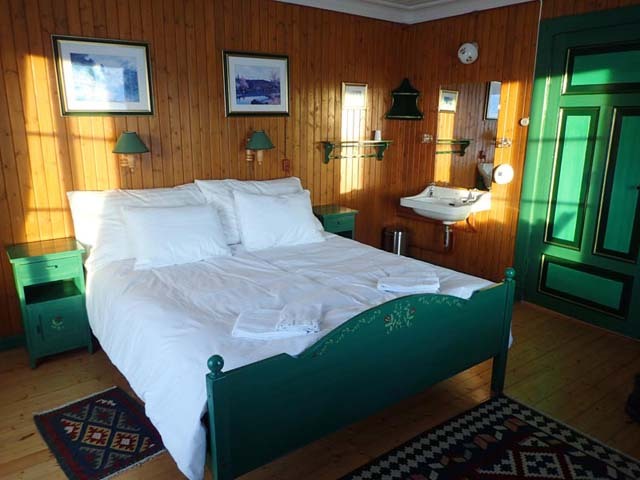 Lovely traditional rooms at Bygdin. Photo: Nature Travels. 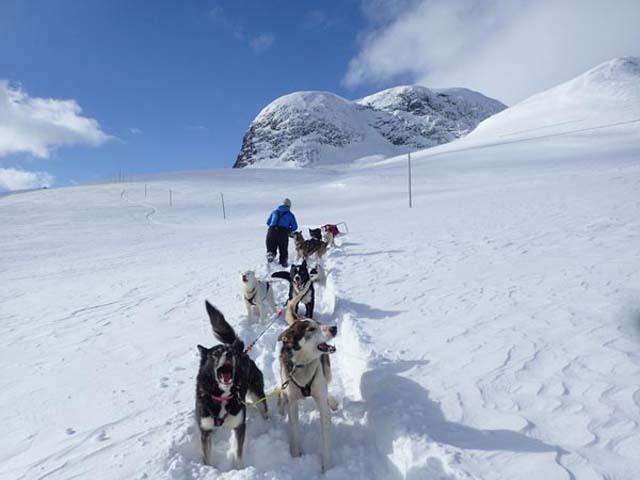 Husky Sledding at the Foot of the Jotunheimen offers a range of multi-day tours of duration 2-5 days. 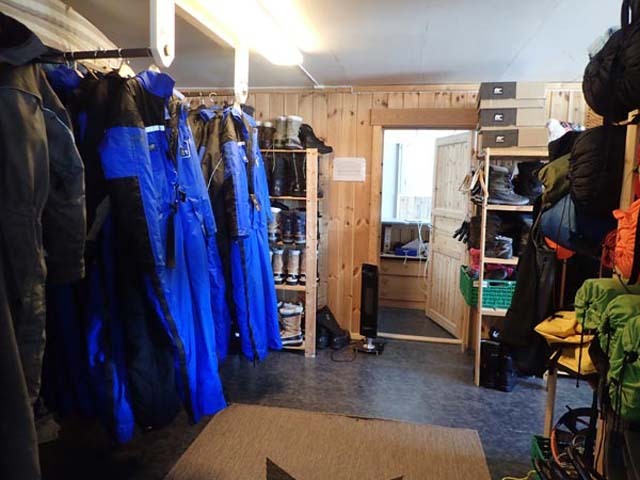 There are a number of overnight cabin locations which can be used in the area depending on weather and trail conditions, and depending on duration the tours normally explore areas of the Langsua and/or Jotunheimen National Parks. For our tour today, we’d be sledding in the same general area but taking a slightly different route, heading over the mountain from where the winter road ends at Bygdin to drop down towards Gjendesheim, where I’d be rendezvousing later in the day with a pick-up to continue my week’s tour of the region. For some of the day we’d be following the line of the road, which in summer is part of the National Tourist Route, but in winter is buried beneath several metres of beautiful snow, with no vehicle to be seen for miles in any direction! A few metres below there’s a summer road down there somewhere! PhotoL BH. This would be both a great opportunity to experience this mountain region as it should be seen (powered by four paws instead of four wheels) and a convenient way to connect with the rest of my itinerary, since travelling to Gjendesheim by road in wintertime requires a 4-hour detour around the mountains. Beitostolen’s main street. Photo: Nature Travels. 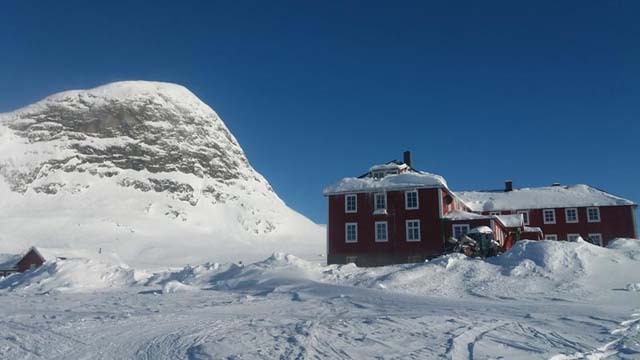 Beitostølen may be a “winter resort”, but if that phrase conjures images of high-rise alpine eyesores, think again – while it’s a great base for winter activities, it feels small-scale, welcoming and unobtrusive. Drive or sled even a short distance outside the village and a wild expanse of rolling hills opens up before you, you turn around to find the houses have disappeared from view and suddenly feel like you’re a million miles from anywhere. I began with a visit to the kennels just a couple of km outside the village, where there are also two simple cabin options to overnight before your tour (as well as after if you wish). For this tour, sledding begins directly in the morning of Day 1, so you will always need to arrive a day before to overnight locally. 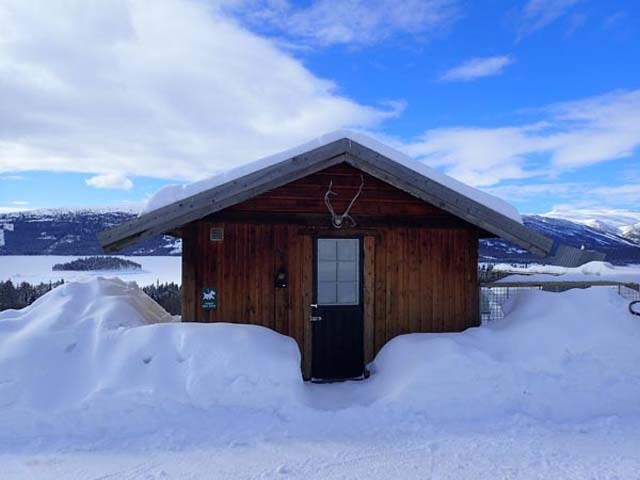 The simpler of the two, the Viewpoint Cabin, is very basic indeed – a simple hut located right next to the main kennel building and suitable for those simply wanting a place to lay their head, but also, as the name suggests, offering a lovely view over the frozen lake below. “Viewpoint” cabin at the kennels. Photo: Nature Travels. The kennels themselves lie a couple of hundred metres down towards the lake, and just below that you find the Wilderness Cabin, also very simple but full of character, a real “Davy Crockett” experience, where you can connect with your inner pioneer for a night in preparation for your mushing adventure! 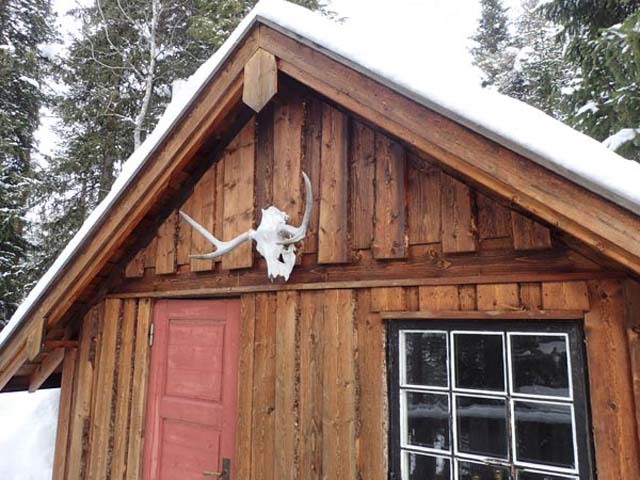 “Wilderness” cabin at the kennels. Photo: Nature Travels. The kennels is small and very personal, with around 55 dogs in total. 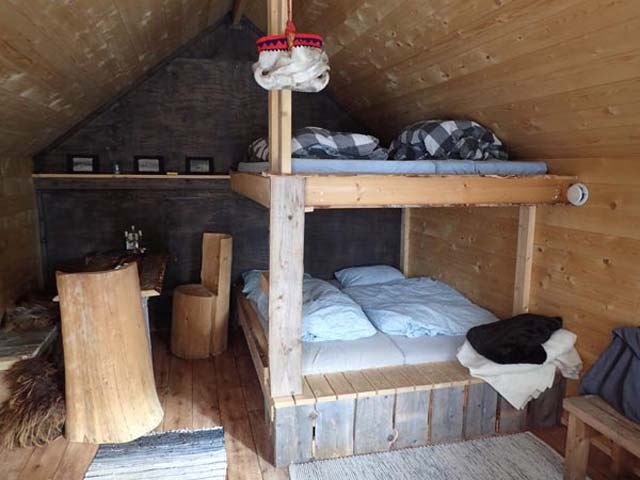 Inside the Wilderness cabin at the kennels. Photo: Nature Travels. The dogs at the kennels waiting for a day in the mountains! Photo: Nature Travels. Today there’d be 3 of us on the trip, myself and Niklas, plus Becky, who had decided to come along too because it was such a beautiful day and she couldn’t bear the thought of us enjoying the mountains without her! 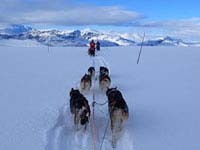 Tandem sled allow two persons to drive at the same time and are a great way to manage a dog team in the mountains. Photo: Nature Travels. 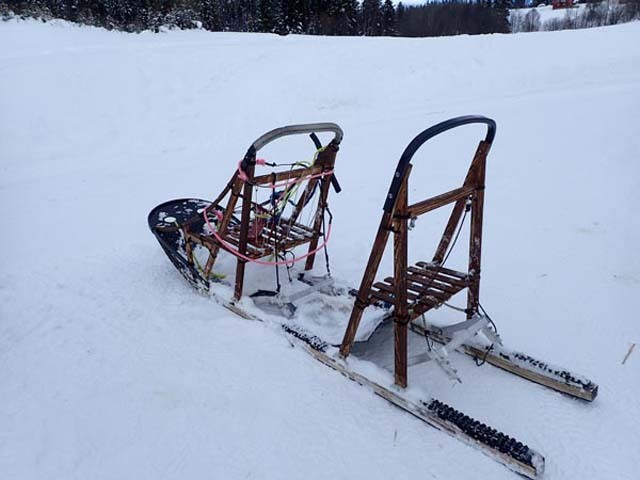 Normally, “tandem” sleds are used for these tours, where two persons drive at the same time. 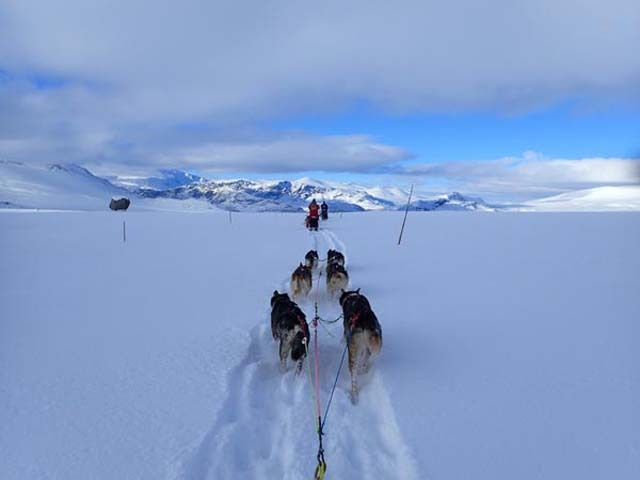 Since the terrain can be demanding and the great majority of sledding is in an open mountain landscape above the tree line, this offers a real advantage in terms of handling of the sleds and working with the dog teams, allowing larger teams of dogs to be used than would be common for single sleds and also allowing a division of tasks between the drivers (in the event of difficulties such as a tangled line, for example, one driver can manage the brakes and keep the sled secured while the other moves forward to fix the problem). 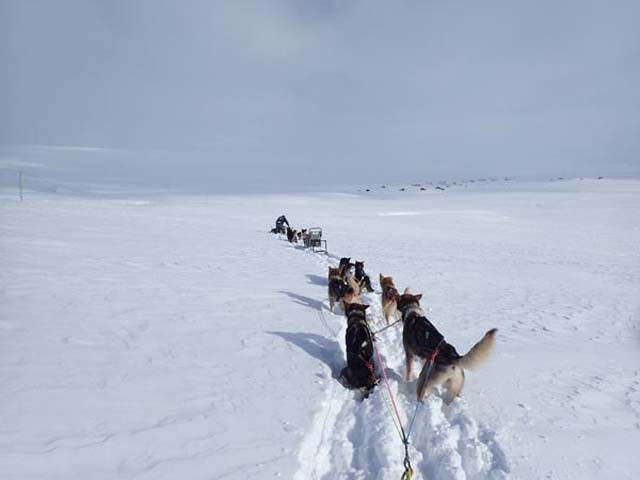 For today, though, we’d be using three single sleds for the trip, and on the return (without me), Niklas and Becky would take the additional dogs from my team and tow my sled behind one of theirs for the way home. Time to get suited and booted! Photo: Nature Travels. 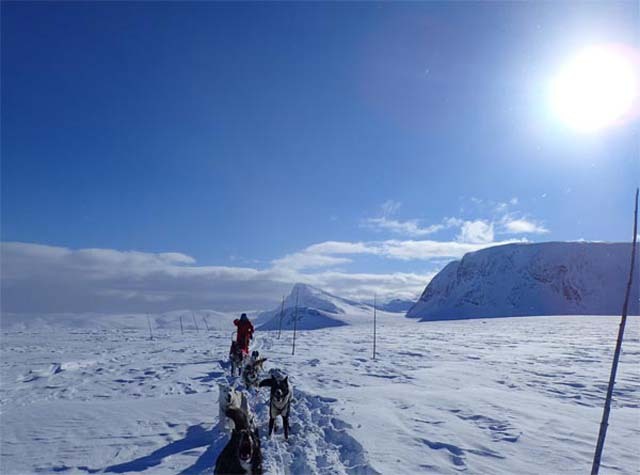 It was all wagging tails and anticipation as we loaded the dogs into the trailer and the sleds onto the truck, and we set off back towards Bygdin, where the winter road ended, to begin our tour. Getting read to head off. Photo: Nature Travels. We started off by taking a wide line to avoid travelling too close to the base of a slope which showed signs of recent avalanche activity, before turning uphill. Predictably, there was no trail to follow on this part of the mountain, so the first hour or so of our trip was a real expedition as we broke a trail through deep snow and made our way to the top of the hill. It was cold, but we were definitely sweating by the time we reached the top! In the absence of a trail, sometimes the dogs need a bit of help knowing where to go! Photo: Nature Travels. 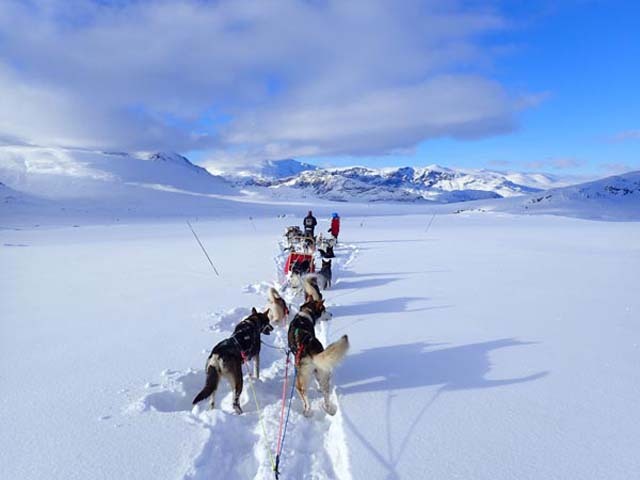 If you think dog sledding is just about standing on your sled and letting the dogs do all the work while you look at the scenery, think again! At times like this, in fresh snow and especially when going uphill, you’re working (almost) as much as they are – helping to keep the sled moving, pulling it out if you get stuck in deep snow, and walking/running behind to take weight off the sled when required. Make no mistake, the dogs can tell whether you’re helping or not, and if they decide you’re not (literally) pulling your weight, they’ll stop and give you a “Hey, come on lazybones, we can’t do everything by ourselves you know!” look over their shoulders until you join in. Sledding in the deep snow can be hard work! Photo: Nature Travels. As we crested the hill, we joined up with what would be the summer road. From here, our direction was easy to follow as tall sticks mark the line of the road, and the snow was also a little more compact and of course the terrain flatter, making the going much easier for the remaining couple of hours of the trip. Ah….another day at the office! Photo: Nature Travels. As we made our way along the top of the hill and started the long descent down towards Gjendesheim, the beautiful mountains of Beseggen (a very popular hiking route in summer) were spread out before us. The afternoon sun dipped below the mountain peaks and the valley was bathed in shadow, and though you could immediately feel the drop in temperature as we lost the sun, our gentle run down to the end point, passing into the trees and at last joining the road, was absolutely idyllic. It’s all downhill from here! Photo: Nature Travels. For me, the day’s sledding was over and I was on my way to new adventures to come on the rest of the trip. 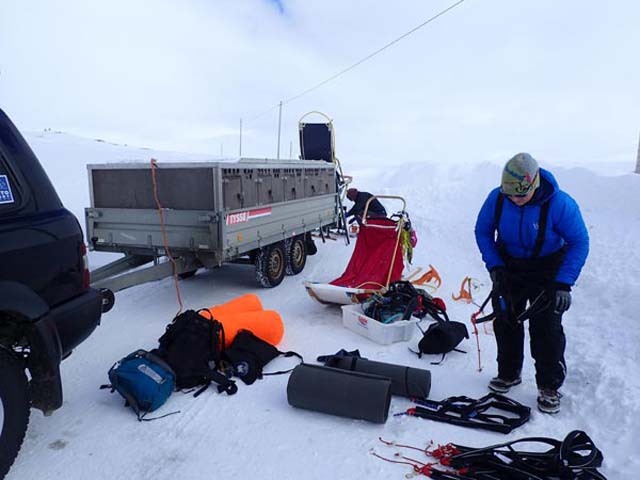 For Niklas and Becky, it was time to reharness the teams and turn for home – and not a minute too soon! 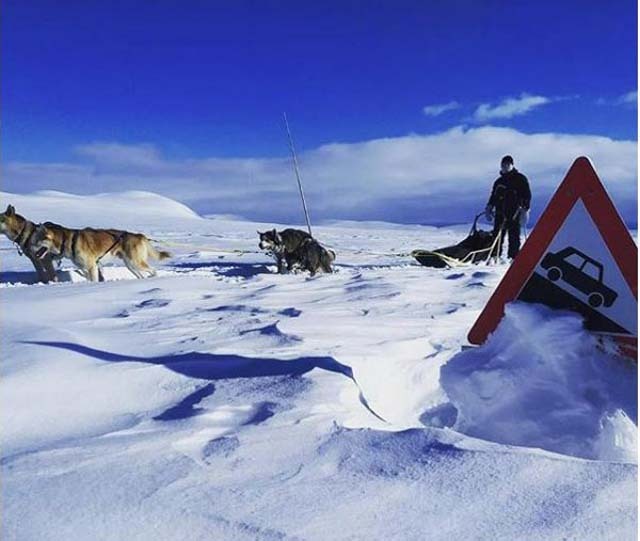 The deep snows and steep climb at the start had meant we are a little behind schedule – it was already 5pm and the winter road from Bygdin is closed at 8pm each evening, so they’d need to hurry to make it back in time! Fortunately, extra dogs on each sled plus the considerable advantage of having a trail to follow on the way back would mean that the journey home was quicker! The mountains of the Besseggen Ridge in the distance. Photo: Nature Travels. What a glorious day it had been – the stunning weather and beautiful views were of course very much a part of it, but as with any sledding trip, it’s the dogs which are the real stars and the joy of working with them the real pleasure. And with conditions in this area normally suitable for sledding until well into May, there’s plenty of time to enjoy it!